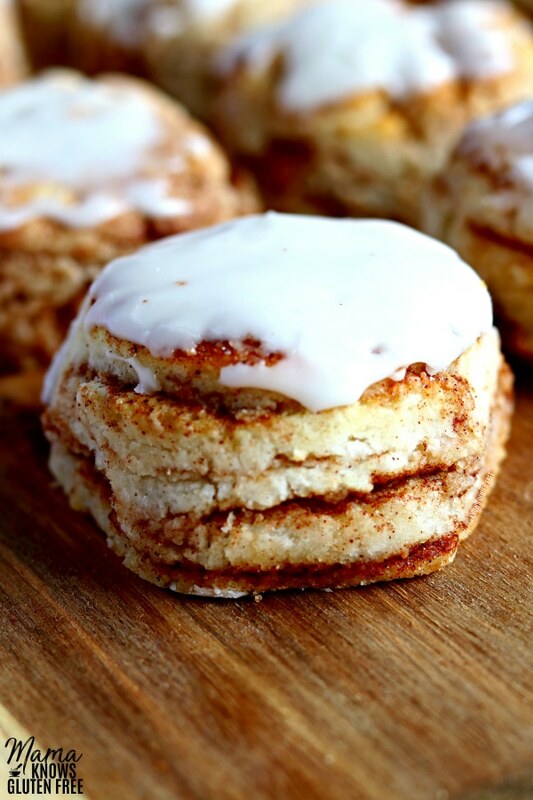 Gluten-Free Cinnamon Biscuits. 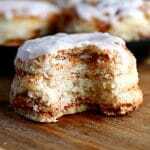 Tender and flaky gluten-free buttermilk biscuits layered with cinnamon and sugar and topped with a vanilla glaze. Recipe with a dairy-free and Vegan option. If y’all were excited about my recipe for flaky and tender Gluten-Free Buttermilk Biscuits, I have taken them to a whole new level! 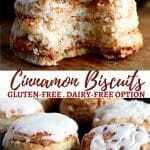 I was so excited to share that recipe with you, but THIS recipe for gluten-free cinnamon biscuits tops even my gluten-free buttermilk biscuit recipe. One of my husband’s favorite breakfast biscuits is Hardee’s cinnamon raisin biscuits, so I knew I wanted to also make a gluten-free cinnamon biscuit recipe. I love all things cinnamon roll! Seriously, have you seen my recipes for Gluten-Free Cinnamon Roll Cake, Gluten-Free Cinnamon Roll Muffins , Gluten-Free Cinnamon Biscuit Balls or Gluten-Free Cinnamon Roll Cookies?! So, turning my gluten-free buttermilk biscuits into cinnamon biscuits was easy for me. 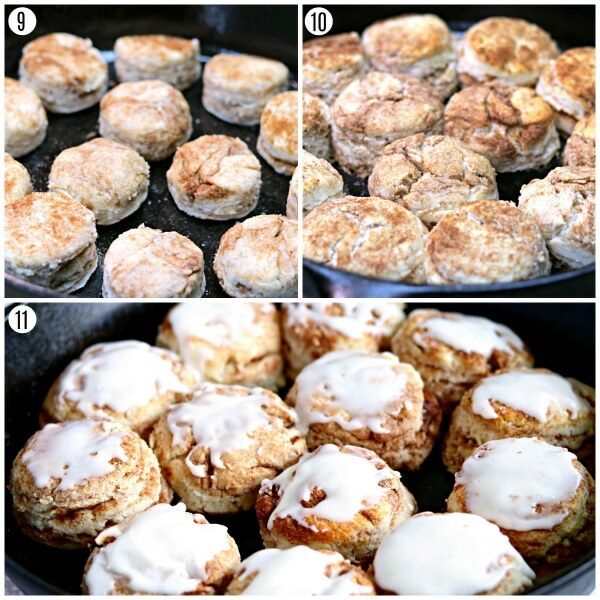 I promise that these gluten-free cinnamon biscuits are easy to make. I’m all about making gluten-free baking easy and delicious! Cut the butter into small pieces and put in the freezer for 10 minutes. Pro Tip: If you do not have buttermilk, you can make your own buttermilk by adding 1 tablespoon of white vinegar or lemon juice to the cup of milk and let stand 5-10 minutes in the refrigerator to keep cold. You can also make buttermilk out of dairy-free milk. The key is to not over mix the dough because over-mixing causes the dough to yield tough biscuits. There is nothing worse than a flat, tough biscuit! Add one tablespoon of flour to a large piece of parchment paper. Place the dough on top of the floured parchment paper. With your hands form a dough round that is about 7 inches in diameter and 1 inch thick. If you make it any larger or flatter you will end up with hard, flat biscuits. Please do not roll out the dough. Gently fold dough over on itself again. (you will have folded the dough 2 times by now) With your hands, form a dough round that is about 7 inches in diameter and 1 inch thick. If you make it any larger or flatter you will end up with hard, flat biscuits. Sprinkle the rest of the cinnamon and sugar mixture over the dough round. Pro Tip: You can also use a larger biscuit cutter to have “Pillsbury Grands” style biscuits. My family actually prefers the larger biscuits when I make cinnamon biscuits. When these beauties came out of the oven and my husband tasted them he said, “You’ve got something really special here!” I would have to agree! I test baked with the Bob’s Red Mill Cup for Cup, Great Value Gluten-Free Flour and Pillsbury Gluten-Free flour. The Bob’s Red Mill flour and the Great Value Flour has sorghum flour in it, which is different from the Pillsbury gluten-free flour. The biscuits made with Bob’s Red Mill and Great Value Brand were not as fluffy and the dough was wetter with the Bob’s Red Mill. I have also included a dairy-free option to the recipe. My husband, myself and youngest son are all dairy-free as well. So now you too can enjoy a gluten-free and a dairy-free cinnamon biscuit. For this recipe, I tested it with both shortening and Smart Balance butter. I used almond milk when baking the dairy-free version. I also really like baking with cashew milk. We recently found out that my husband has an egg sensitivity. My husband LOVES biscuits, so I knew that I had to try and make my biscuits egg-free. I used Bob’s Red Mill Egg Replacer, which is also gluten-free. They turned out great! They were not as fluffy as my regular cinnamon biscuits but they were just as flaky and delicious. I made them both dairy-free and egg-free, so they would also be Vegan biscuits. So if you also need to be egg-free or are Vegan you too can enjoy my gluten-free cinnamon biscuits! 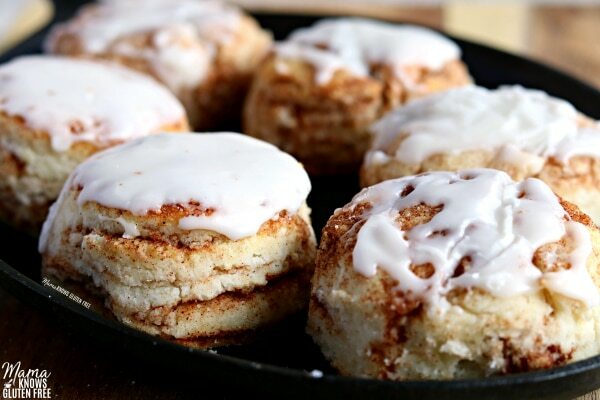 Tender and flaky gluten-free buttermilk biscuits layered with cinnamon and sugar and of course topped with a vanilla glaze, just like a cinnamon roll. Look at those layers of cinnamon and brown sugar! Make sure you check out my other Gluten-Free Breakfast Recipes! 2 cups gluten-free all-purpose flour I like Pillsbury gluten-free. Not all gluten-free flours are created equal. You may experience different baking results depending on the gluten-free flour blend you choose. 1 cup buttermilk dairy-free use almond, cashew, or coconut milk. Make your own buttermilk by adding 1 tablespoon of white vinegar or lemon juice to the cup of milk and let stand 5-10 minutes in the refrigerator to stay cold. 2 teaspoons milk , dairy-free use almond, cashew, or coconut milk. In a large bowl add the gluten-free flour, baking powder, salt, sugar, and give it a quick whisk or stir to combine the ingredients. I like Pillsbury gluten-free flour. Not all gluten-free flours are created equal. You may experience different baking results depending on the gluten-free flour blend you choose. Cut the butter into small pieces and put in the freezer for 10 minutes. If you do not have buttermilk make your own buttermilk by adding 1 tablespoon of white vinegar or lemon juice to the cup of milk and let stand 5-10 minutes in the refrigerator to keep cold. You can also make buttermilk out of dairy-free milk. Add in the buttermilk and the whisked egg and stir until a soft dough forms. (I whisk the egg right in the buttermilk) The key is to not over mix because over-mixing causes the dough to yield tough biscuits. The dough will be sticky. PLEASE DO NOT ROLL OUT THE DOUGH. Place the dough on top of the floured parchment paper. In a small bowl add the brown sugar and cinnamon and stir to combine. 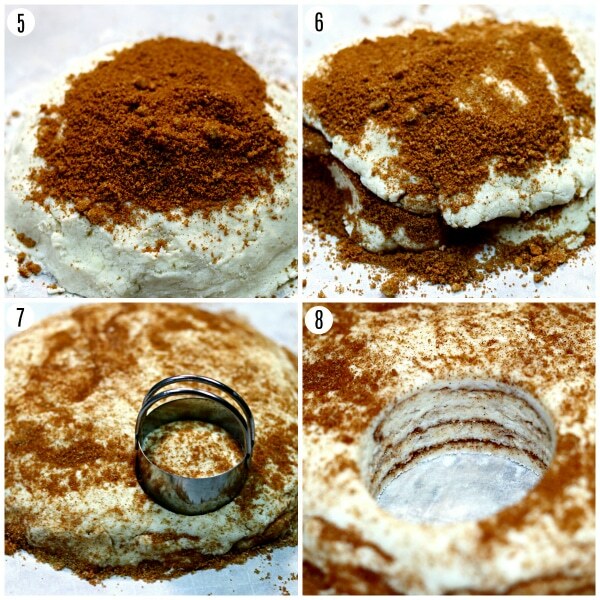 Sprinkle 2 tablespoons of the cinnamon sugar mixture all over the top of the dough round. Gently fold dough over on itself. Sprinkle another 2 tablespoons of the cinnamon sugar mixture over the dough. You do this by folding the dough in half on top of itself. Gently fold dough over on itself again. (you will have folded the dough 2 times by now) With your hands form a dough round that is about 7 inches in diameter and 1 inch thick. If you make it any larger or flatter you will end up with hard, flat biscuits. Sprinkle the rest of the cinnamon and sugar mixture over the dough round. Cut out 2-inch biscuits using a biscuit cutter, the mouth of a glass or the lid of a mason jar. Do not twist cutter when cutting; this will crimp the edges of the biscuit causing it not to rise well. Reform the dough scraps into a dough round. Put the biscuits on a greased large cast iron pan or baking sheet. You will have 12 biscuits to bake. Bake the biscuits for 15-20 minutes at 450° F. At the 15-minute point please check your biscuits to see if they are golden brown. Please watch your biscuits because all ovens are different. In a small bowl stir together the glaze ingredients until smooth. Spread the glaze over the cinnamon biscuits. Serve warm and enjoy! The biscuits can be stored in an airtight container. They are best enjoyed warm. I test baked with the Bob's Red Mill Cup for Cup, Great Value Gluten-Free Flour and Pillsbury Gluten-Free flour. The Bob's Red Mill flour and the Great Value Flour has sorghum flour in it, which is different from the Pillsbury gluten-free flour. The biscuits made with Bob's Red Mill and Great Value Brand were not as fluffy and the dough was wetter with the Bob's Red Mill. For dairy-free option: use shortening and almond, cashew or coconut milk. For egg-free use Bob's Red Mill Egg Replacer. If Vegan use egg replacer, shortening/Smart Balance butter, and dairy-free milk. The key is to not over mix the dough because over-mixing causes the dough to yield tough biscuits. There is nothing worse than a flat, tough biscuit! Please do not roll out the dough. I have the K&S Artisan Complete Pastry Cutter Set. Thank you Lyn for the wonderful 5-star recipe review! Biscuit dough definitely should not be over mixed and handled too much. That’s why I only fold it over twice then cut out the biscuits (I don’t roll out the dough). I’ve never tried a pizza cutter, but I’ll have to give it a try. Thanks for the tip! I hope you enjoy the cinnamon biscuits! Do you think I could make the dough the night before or would it get too tough/dry? Hi Erin! I have not tried it, so I’m not sure. Gluten-free baking can be tricky and ingredients do not act the same as traditional baking. I personally make the dough fresh and it only takes me a few minutes. If you try it will you please let me know how it turns out? I made the biscuit recipe and saved half of the dough for cinnamon biscuits the next morning. They turned out just fine in the morning, my kids loved them. Thank you so much Gwen for the wonderful 5-star recipe review! I am so happy to hear that you and your kids loved the biscuits and the cinnamon biscuits. I’ve never used the dough the next day, I’ve just frozen it to bake later. Biscuits are a family favorite of mine as well. Thank you again! Thank you so much Kim for the wonderful recipe review! My heart is so happy to hear that you can enjoy southern style biscuits again. You are so welcome, I love sharing what I make for my family! These were amazing! However, when I followed the recipe exactly, the proportions were off. I ended up having to nearly *double* the GF flour to get the right consistency. (Before, it was pure liquid!) I was nervous about how these would turn out considering how much I changed it (I also used a flax egg), but it turned out amazing! My 4-year-old couldn’t stop raving about them. Will definitely make again! Hi Ashley thank you so much for the wonderful 5-star recipe review! I am so happy to hear that you and your family enjoyed the cinnamon biscuits. I would like to figure out why your biscuits dough did not turn out like mine. Can you please tell me what brand of gluten-free flour you used? Some brands of gluten-free flours do not absorb the milk as well and the dough can be wetter. I tested several brands of gluten-free flour and found this happened with flour blends that had sorghum flour in it. 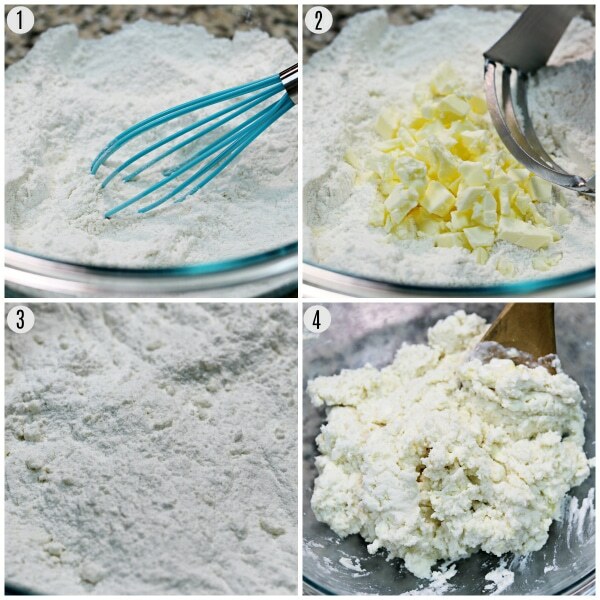 My favorite gluten-free flour is Pillsbury gluten-free and I am currently testing baking with Betterbatter. You should not have had to add to any extra flour to the recipe, but I am glad that they turned out with the extra flour. I have not tired a flax egg, but I have used the Bob’s Red Mill egg replacer in the recipe(my husband is now egg-free). Thank you again! I have made these biscuits several times now. No change to recipe. I use measure to measure King Arthor Flour, so I believe you could use whatever gluten free flour you typically bake with. They are amazing! Biggest WOW factor is the softness. Difficult to achieve in gluten free. Make sure you allow dough to be sticky while folding in the brown sugar and don’t over bake. My family of four gobbles them up and I have taken them to meetings of gluten and non gluten free diets with smiles all around. Love the recipe. Thank you for sharing! Thank you so much KT for the amazing 5-star recipe review! I am so happy to hear that you and your family enjoyed the biscuits. That really blessed me and made my day! My family loves these too. It’s always great to hear when people who are not gluten-free enjoy them also. You are welcome, I love sharing what I make for my family. Thank you again!